Home » Is this an alien skull? Is this an alien skull? 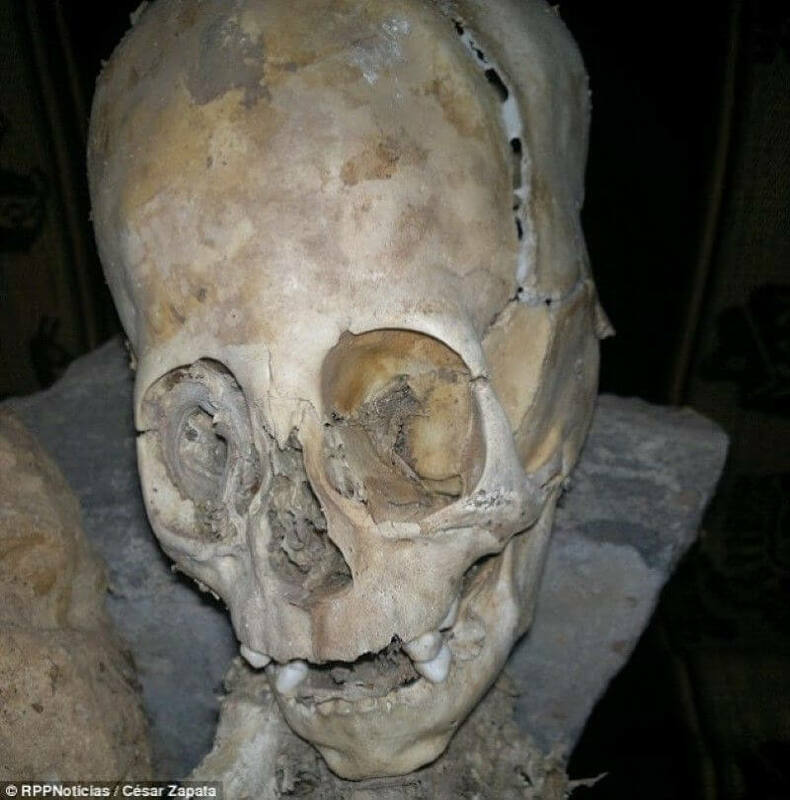 A mummified elongated skull found in Peru could finally prove the existence of aliens. The strangely shaped head – almost as big as its 50cm (20in) body – has baffled anthropologists. It was one of two sets of remains found in the city of Andahuaylillas in the southern province of Quispicanchi. The skeletal sets were discovered by Renato Davila Riquelme, who works for the Privado Ritos Andinos museum in Cusco in south-eastern Peru. He said that that the eye cavities are far larger than normally seen in humans. There is a soft spot in the skull – called an open fontanelle – which is a characteristic of children in their first year of life, yet the skull also has two large molars, only found in much older humans. Davila Riquelme said three anthropologists, from Spain and Russia, arrived at the museum last week to investigate the findings and agreed it was ‘not a human being’ and would conduct further studies. The remains of an eyeball in the right socket will help determine its geneticDNA – and clear up the controversy if it is human or not. The second mummy is incomplete and is only 30cm (12in). It lacks a face and seems to be wrapped in a layer as a placenta, fetal position. The remains bear a striking resemblance to the triangular crystal skull in the 2008 Indiana Jones film Kingdom of the Crystal Skull – which turned out to be of alien origin and have supernatural powers. Painting by Paul Kane, showing a North American Chinook child in the process of having its head flattened, and an adult after the process. The alternative explanation for the bizarre discovery is that the skull was artificially deformed as part of a tribal ritual. The practice of skull elongation – to signify group affiliation or social status – dates back 9,000 years. Common in various tribal cultures around the world (such as Mayans, North American natives and Australian Aborigines), the head moulding styles fell into three groups: flat, round or conical. To achieve the desired shape, the head was wrapped in tight cloth. In the case of cranial flattening, the head was placed between two pieces of wood. The technique would usually be carried out on an infant, when the skull is at its most pliable. The cloth would be applied from a month after birth and be held in place for about six months.